Die Auswirkungen der vorläufigen und endgültigen Eigenverwaltung auf die umsatzsteuerliche Organschaft. 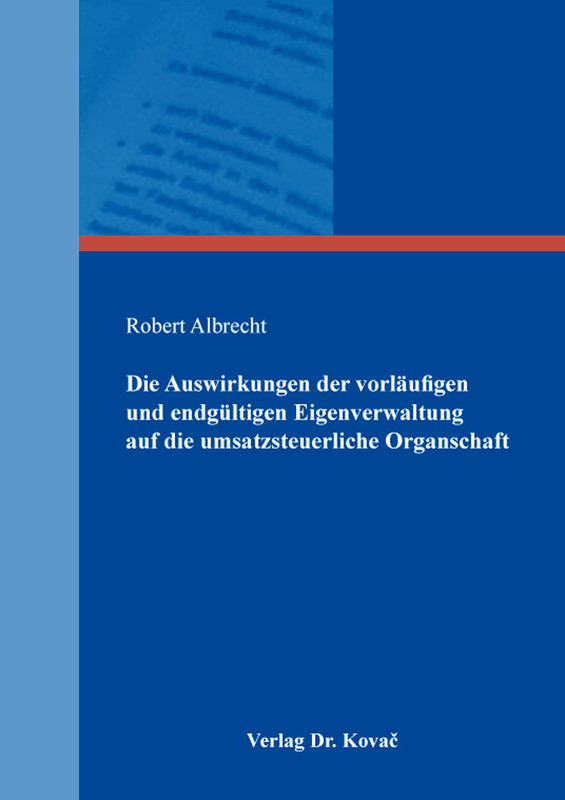 Dissertation (english) von Robert Albrecht, Verlag Dr. Kovač 2018, 228 S.
If several companies are linked to form a group, insolvency proceedings may only be opened against the parent company, subsidiaries or all companies of a group. The question then arises as to how this will affect any existing VAT group, namely whether it will continue to exist or whether it will be terminated by crisis, preliminary or opened insolvency. The impact of crisis and insolvency on the institution of the VAT group has always been problematic and has therefore been the subject of numerous decisions by the German fiscal courts. While the relationship between preliminary and opened regular insolvency proceedings and the VAT group has been clarified by the BFH's case-law, jurisprudence with regard to the newer institute of self-administration, in particular within the framework of the preliminary self-administration proceedings introduced by the ESUG pursuant to � 270a InsO and the protection screen proceedings pursuant to � 270b InsO, is still open to question. In a first part, this work provides a systematic overview of the opinions in literature and case law on the consequences of the preliminary and opened insolvency proceedings in the context of the insolvency of one or more group companies and will then shed more light on the relationship between the preliminary and opened self-administration and the VAT tax group.